In March and April 2018, anti-fracking activists scored two crucial victories. First, the National Police Chiefs Council (NPCC) agreed to a public consultation on the policing of anti-fracking protests. According to a report released in November 2017 by the Network of Police Monitoring, the police have increasingly adopted a “confrontational” approach towards environmental protesters under the influence of a strong lobby from oil companies trying to limit the impact of anti-fracking demonstrations. The report details "evidence of police officers pushing people into hedges and even knocking them unconscious, violently dragging older people across the road and shoving others into speeding traffic". 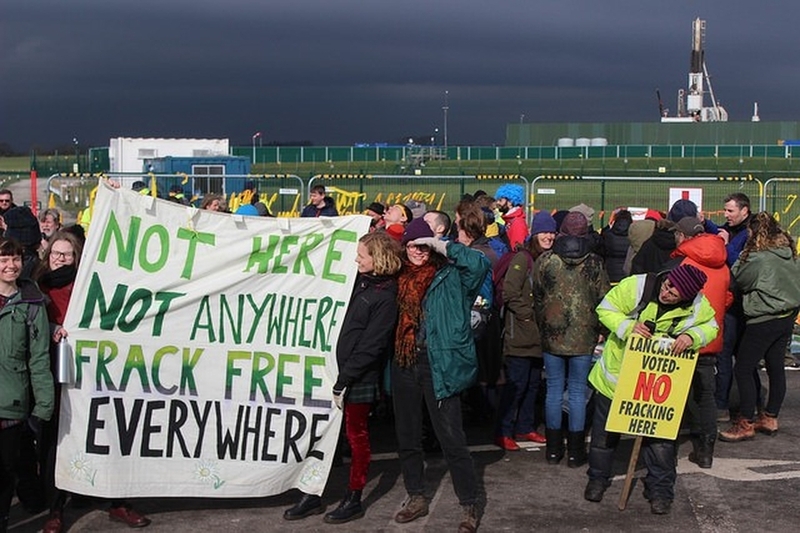 The report also contains an accusation against the Lancashire police for "ignoring violent and unlawful actions by private security employed by [oil and gas exploration company] Cuadrilla". The consultation will contribute to draft guidelines for policing of anti-fracking demonstrations. "UKOG have climbed down on the most draconian clause of an injunction they propose to bring against ‘persons unknown’ who might seek to oppose their oil exploration activities in Sussex and Surrey. This is a victory for democracy. No way should a company’s economic interests trump human rights". "Those who seek to defend lawful conduct, and have no intention of committing unlawful activity and have not done so in the past, have to take all the risk by being named in the procedures. This is, in effect, permitting the claimant to start proceedings without properly constituting a claim". The trial of 15 activists - accused of blocked a plane at #Stansted Airport from flying asylum seekers back to Africa - is due to resume today. On 24th March, the trial of 15 anti-deportation activists from the End Deportations campaign was adjourned until further notice. In March 2017, the protesters had prevented a charter flight due to deport migrants to Nigeria and Ghana by chaining themselves to the airplane in Stansted. The demonstrators were charged with terrorism, which could lead to a life sentence. Many have shown support for the activists and questioned the legitimacy of such disproportionate and severe charges, which some also see as a measure to discourage future protests against the government's migration policy. "This call for evidence comes at a crucial time for the sector. It is vital that charities help the government build a strong strategy for civil society that commands support across communities and across political divides. It is also important that this strategy embraces and influences the whole of government – from foreign policy to domestic reform, so that charities can play their full part as a vital part of the British society and economy". In response to the Oxfam scandal as the charity was accused of covering up alleged sexual misconduct by its staff in Haiti and elsewhere, the Department for International Development in the UK (DFID) convened a summit on 5th March to address sexual exploitation within the international aid sector. The government also issued a number of tasks to the sector. One of these is to develop stronger safeguarding standards, including assessment of code of conducts, identification and response to incidents, and risk management strategies. The government has said that failure to meet these standards will result in a loss of DFID funding. "Now is the time for action. The aid sector needs to ensure it is meeting its duty of care to the world’s most vulnerable people. It needs to be honest about past mistakes. It must do all it can to win back the trust of the British public. [...] This summit is a crucial moment to learn lessons from the past and drive up standards across the sector. [...]Today, we begin taking the practical steps to ensure the safety of the people we help is always our first priority and that the British aid sector sets the standard for the rest of the world to follow". A report by the Charity Finance Group (CFG) found that bank de-risking is creating a real threat to charities and having "a disproportionate negative impact on banks’ perception of risk associated with the sector and consequently on the ability of the charity sector to access banking services". Banks undertake de-risking in cases of non-compliance with anti-money laundering and counter-terrorism regulations. Measures taken include slowing down transactions, and freezing or closing accounts. The report highlights that the majority of international charities surveyed were affected and that de-risking "has hampered the ability of charities and NGOs to deliver legitimate charitable activities both domestically and internationally". Because some NGOs carry out their work in high-risk environments, NGOs are often rated 'medium-risk', making their accounts particularly vulnerable to de-risking. However, according to the 2017 National Risk Assessment, existing regulation on anti-money laundering and terrorism in the sector is “sufficient”, and the appropriate level of risk for NGOs should be “low”. "Bank de-risking remains a real threat to our sector and the work that it does overseas. We welcome the government’s change of the National Risk Assessment and the efforts being taken by the Home Office to create a dialogue across government with the sector. But this engagement needs to be sustained. We hope the Financial Action Task Force’s evaluation of the UK’s money laundering will further consider how regulations have disproportionally impacted our sector and what can be done to improve the situation for charities". On 1st March, Secretary of State Matthew Hancock announced that, following a public consultation, Section 40 of the Crime and Courts Act 2013 will not be enacted. Under Section 40, newspapers not registered with the state-backed regulator Impress would have been responsible for the payment of costs on both sides in any privacy disputes. The news was welcomed by press freedom groups, stating that the measure would have had a substantial chilling effect on media watchdog activities. "the commencement of the provision would have punitive effects on the press for reporting on public interest issues in the UK, and have an especially onerous impact up on local and regional newspapers who are already facing significant financial challenges. It would also mean that the UK as a long-standing bastion of press freedom would send out a negative message to other states on the possibilities to regulation". "This announcement conveniently timed to be buried under a flurry of snow is a disappointment, a breach of trust and a bitter blow to the victims of press intrusion, but it is not in any way a surprise. We now know for certain what we have suspected all the time: When Conservative Prime Minister David Cameron joined the leaders of other parties to say that he would keep his promise to the victims of phone hacking, he and his party were not acting out of conviction but weakness". "Under international human rights standards, the public has a vital interest in an accountable and responsible press. Self-regulation of the press must, therefore, be meaningful. It must not only provide protection for members of the journalistic profession and media industries, but also hold them accountable to their profession and hold press outlets accountable to the public". Similar provisions imposing the payment of all costs by the media defendant during data protection lawsuits were included in the Data Protection Bill under discussion in the House of Commons. While the committee voted to repeal them, rumour has it that the Labour Party will push to re-insert them during the bill's committee stage or the discussion in the House of Lords. "We remain concerned about the prospect of this worrying cost-shifting provision under any guise. These measures threaten press freedom, and have no place in the Data Protection Bill". In March, the Joint Committee on Human Rights released a report on free speech in universities, showing that obstacles to free speech, including intolerance and intimidation, regulatory complexity, and excessive bureaucracy exist on campuses. The Committee also provided a guideline for universities and students to overcome these obstacles.